The Falcons finished the regular season in third place in the AFC South. But they got to the Super Bowl last year and that’s enough to make them the favorite against the NFC East-champion and No. 1-seeded Eagles in Saturday’s NFC divisional game at Philadelphia. The Falcons beat the Rams in a wild-card game. That victory pushed ticket prices for Saturday’s divisional game up. According to data from TicketIQ.com, the average asking price for a ticket to the game is $485, up $22 from last week.The get-in price for the Saturday’s game jumped from $199 last week to $213, a 7% increase. Philadelphia is the first No. 1 seed since the NFL began awarding home-field advantage based on teams’ regular-season records to not be the favorite in a divisional game, according to ESPN.com. The Eagles, who are in the playoffs for the first time since 2013, have not won the NFC East since the 2003 season, after which they when they went on to lose in the Super Bowl to the New England Patriots. Philadelphia is a 2.5-point underdog. If you want to be part of the excitement at Lincoln Financial Field, TicketIQ.com can help. Among the company’s Low Price Guarantee listings, seats were available for $215 in Row 21 of Section 233 or as much as $1,095 in Row 34, Section 120 behind the Falcons’ bench. Carson Wentz is on the bench, but no matter, the rest of the Eagles have picked up the slack and Philadelphia is playing in the NFL post season for the first time since 2013. Maybe more important, the Eagles have been dominant and have a first-round bye for the first time since winning the NFC East after the 2003 season, when they reached the Super Bowl only to lost to the Patriots. 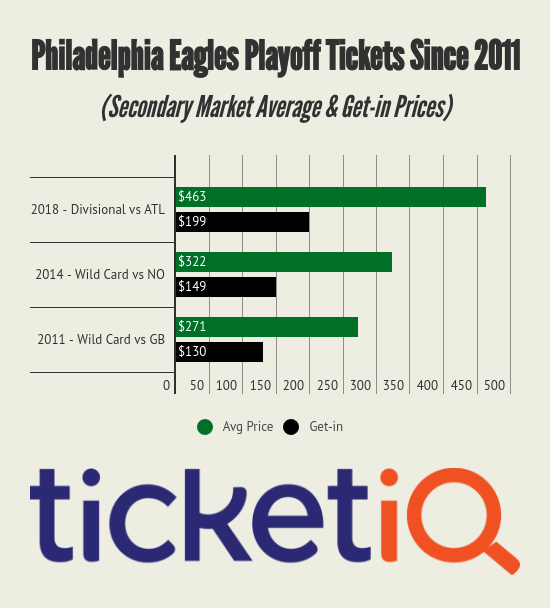 The Eagles success has sparked plenty of enthusiasm around Philadelphia – so much so that a ticket to the Jan. 13 is the second most expensive for a divisional playoff behind the Patriots, according to TicketIQ.com data. A ticket to the Eagles game has a current average asking price of $463 while a ticket to the Patriots game is currently $541. The Eagles and the Patriots are the only two teams who have home-field through the playoffs. Where does current ticket price fall historically? Dating back to 2011, when TicketIQ.com began tracking data, this is the most expensive post-season game involving the Eagles. A ticket to the 2014 wild-card game against the Saints clocked in at No. 2 at $322 and a ticket to the 2011 wild-card game against the Packers cost $271. For the upcoming game, fans can get in for $199. As of Jan. 2, TicketIQ.com had 5,817 tickets available. With wild-card games kicking off next weekend, whom the Eagles will host is unclear, but they’ll get the lowest remaining seed in the NFC – either New Orleans, Carolina or Atlanta. If you want to be part of the excitement at Lincoln Financial Field, TicketIQ.com can help. 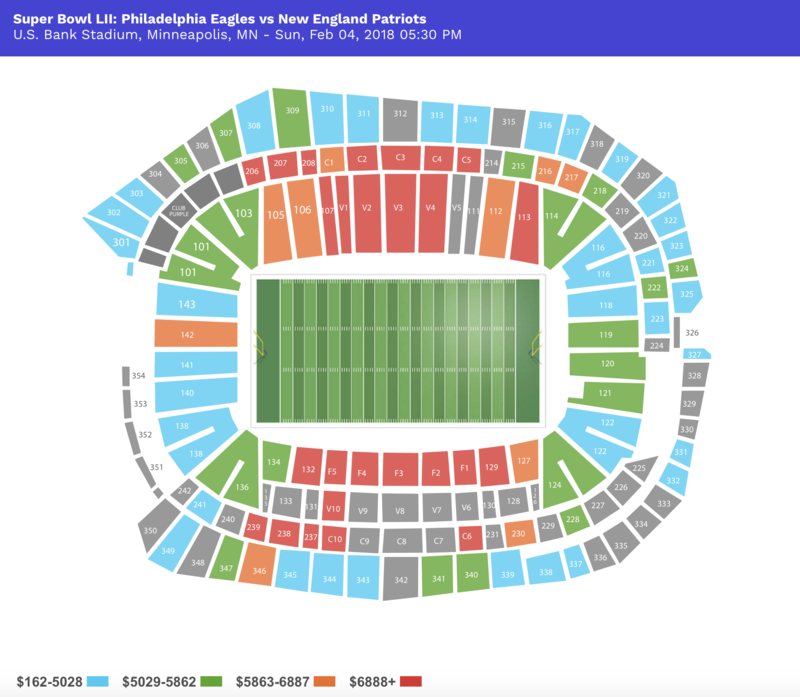 Among the company’s Low Price Guarantee listings, seats were available for $294 in Row 13 of Section 233 or as much as $1,051 for a third-row seat in Section 102 behind the Eagles’ bench.